I am lucky enough to have a family that tries to accommodate my Vegan lifestyle as much as possible. The other night we were having soup beans and cornbread for dinner, and my family planned in advance to make sure everything was vegan. For the Soup Beans, they replaced the ham broth with veggie broth. For the Cornbread, we veganized one of our favorite cornbread recipes. I had never really made cornbread of any kind on my own, so my Step Mother (Amanda) was nice enough to help me with this. She makes some of the best baked goods I have EVER had. If we were being completely honest, she took the lead on this. I helped cut up Jalapenos and forgot to wash my hands before I touched my face. If you have ever done that, I do not need to tell you how uncomfortable it is! Needless to say, I was not much help during this process. 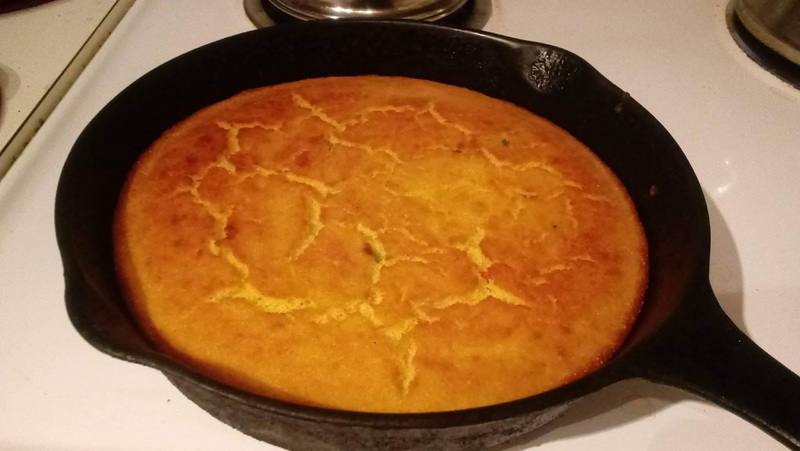 To make the perfect Cornbread, a cast iron skillet is a necessity! If you do not already have one, I recommend this one! 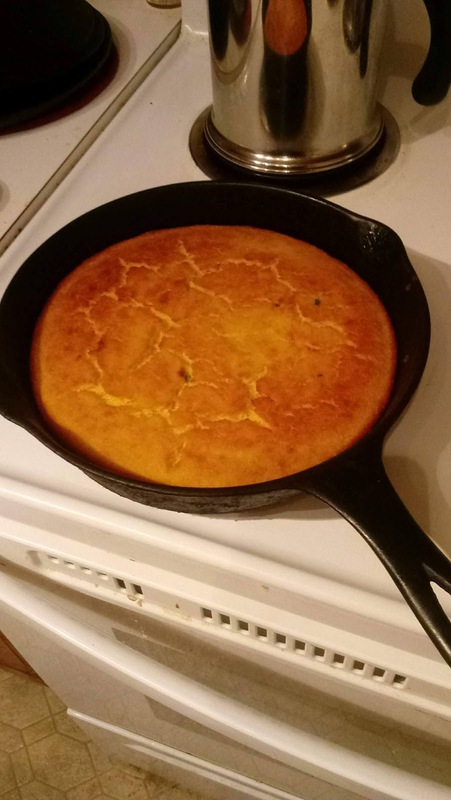 Using a Cast Iron skillet is the perfect way to get the perfect crust on the Cornbread and it makes a world of difference! Amanda also mentioned that this recipe would make amazing Vegan Cornsticks! To make Cornsticks, you would follow the same recipe and instructions below but you would cook them in a pan like this one! For this recipe, we had a few jalapenos laying around so decided to throw those in as well. I don't know about you, but I LOVE Jalapeno Cornbread! For this recipe, you can use your favorite egg substitute. I prefer unsweetened applesauce you could also use a chia seed or flax seed slurry. 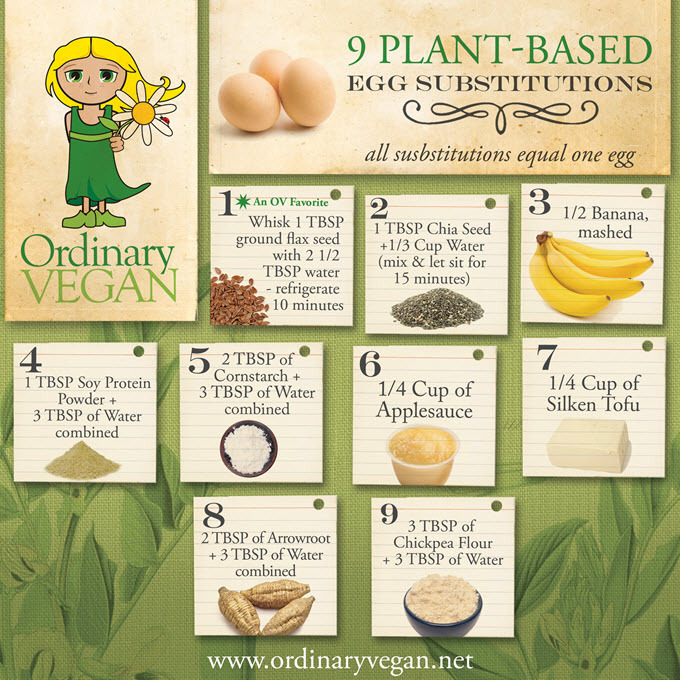 Check out the graphic below for more plant-based egg substitute options. To make a Vegan buttermilk, we took almond milk with 1 1/2 tablespoons of white vinegar. After mixing the almond milk and vinegar you let it sit for 10-15 minutes. I have used this Vegan buttermilk hack on many different occasions and it always turns out well! What are your favorite vegan recipe hacks? Let me know in the comments below! 2. In a large bowl, whisk together the cornmeal, salt, baking powder, and baking soda. 3. Make a well (hole) in the center of the mixture and drop in the vegan buttermilk, eggs, and melted coconut oil. Use a fork to mix the wet and dry ingredients together until thoroughly combined. 4. 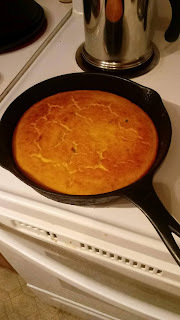 Pour the cornbread batter into the hot skillet, and bake until the cornbread is golden brown and a toothpick inserted in the center comes out clean. This will take about 23 minutes. I love a good cornbread! I agree that use of cast iron is a necessity. Interesting to see how to sub for the egg. I'll share it with my vegan friends! As soon as I saw jalapeño, I was hooked! I love jalapeño cornbread but have never made my own. Saving your recipe, thanks for sharing! I absolutely love a cornbread recipe! This sounds amazing especially with the jalapeño kick to it! yum yum yum -- i love jalapeno cornbread! this is my favorite type of cornbread. love that spiciness in there! You had me at corn bread lol. This looks good. Im making chili next week and this would go perfect. Yum, I love cornbread and making it vegan makes it even better. I was a vegan for years, but switched to a vegetarian diet when I kept running into foods that I loved but couldn't have. But that was years ago, and it's soooo much easier to find yummy, vegan recipes. I love the sound of your cornbread! Perfect comfort food for fall! I am a huge fan of cornbread. and this is perfect for me. Will definitely try this recipe. I will try this recipe. My husband just asked for it yesterday and then I come across this recipe in your blog. Awesoe. Thanks for sharing.